Simon & Schuster, 9781501146282, 368pp. Shakespeare’s Richard II presents a momentous struggle between Richard II and his cousin Henry Bolingbroke. Richard is the legitimate king; he succeeded his grandfather, King Edward III, after the earlier death of his father Edward, the Black Prince. Yet Richard is also seen by many as a tyrant. He toys with his subjects, exiling Bolingbroke for six years. 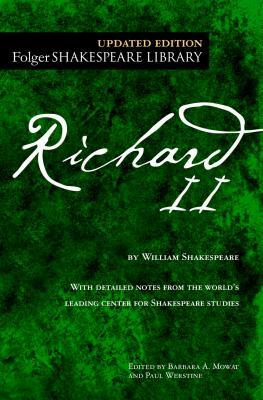 When he seizes the title and property that should be Bolingbroke’s, Richard threatens the very structure of the kingdom. Bolingbroke returns with an army that is supported by nobles and commoners alike, both believing themselves oppressed by Richard. This sets the stage for a confrontation between his army and the tradition of sacred kingship supporting the isolated but now more sympathetic Richard. Essay by Harry Berger, Jr.